The Newcastle airport has 1 terminal building, which was extended in 2012. 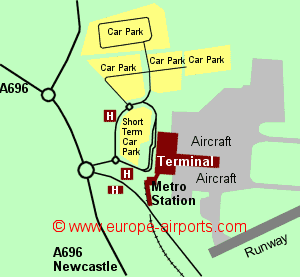 There is a frequent metro link between the airport and Newcastle Central Railway Station. The metro station is accessed via a covered walkway from the airport terminal and the journey time is 23 minutes, with trains running at 12 minute intervals during the day. A public bus service also links the airport with Newcastle city. Facilities include 9 bars/cafes/restaurants, 11 shops, 2 foreign currency facilities, 2 executive lounges, Internet access kiosks, and WiFi Internet access (free for 45 minutes). The Double Tree by Hilton hotel is situated approximately 100m from the terminal building, while the Premier Inn Newcastle Airport and Britannia Airport Hotel are approximately 200m. 5.3 million passengers passed through Newcastle airport in 2017, a 10% increase from the previous year, but still below the 5.6 million record of 2007.